I am starting with my “Daily Routine Series” videos on YouTube as I finished off my “Weekly Routines Series”. My Daily Routines consist of two parts: Moisturizing my hair and then Sealing in that moisture. The first video demonstrates how I mix my “DIY (Spray) Moisturizing Leave-In Conditioner”. You can see the video here or read through my mix under the “Mai Hair Routines” Tab titled “DIY Leave-In Spray”. My spray is really “light” and therefore I use this when my hair only needs a little moisturizing. I usually use this in the morning on days when my hair is not extremely dry and will occasionally also use it at night (before bed) just to make sure my hair remains supple and moisturized. What is your favorite “light” moisturizer? 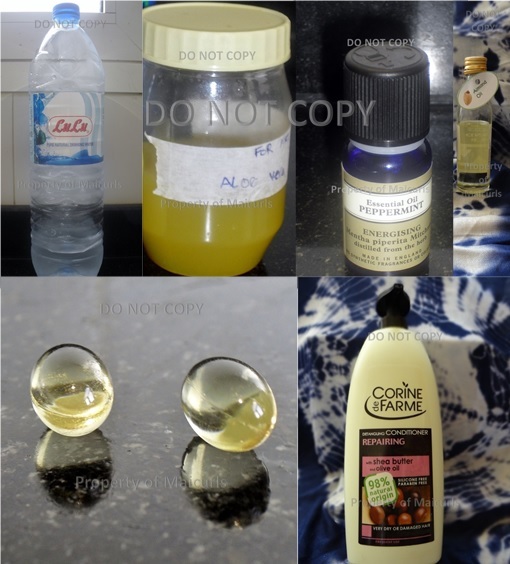 This entry was posted in DIY Spray Leave-In, moisturizing hair and tagged Daily Routine, DIY Moisturizing Natural curly Hair, DIY Moisturizing Natural Hair, Leave-In Conditioner Spray, Moisturized Supple hair, Moisturizing Hair on October 22, 2013 by Maicurls.